The patch has an adhesive iron-on backing that be used as a sticker for scrapbooking or as an iron-on to clothing or other items. The iron-on might not adhere to all materials. IF YOU ARE GOING TO WASH THE ITEM THEN THE PATCH NEEDS TO BE SEWN ON ALSO AFTER IRONING IT ON. If you don't want to iron or sew the patch on you can also use patch glue or Fabri-Tac to adhere the patch to you item. Both of those items are sold on Amazon. 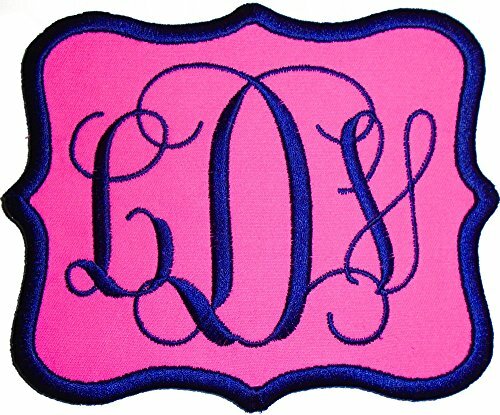 You can customize the applique patch with your 3 initials, letter thread color and outline border thread color. The picture in the listing has the different thread colors you can choose from. You can apply to clothing, backpacks, towels, blankets, purses, hats and more. Type initials in this order - 1. first name 2. LAST NAME (center big letter) 3. middle name. Number are not available in the interlocking vine font. If you put numbers for the initials a different font will be used. The patch has iron-on adhesive on the back for iron but does not adhere to all materials. The patch works best if you iron it on the item to hold the patch in place then you sew it on afterward. The patch should be sewn on to all washable items for best results. If you don't want to iron or sew the patch on you can also use patch glue or Fabri-Tac to adhere the patch to you item. Both of those items are sold on Amazon. Iron-On Patch Instructions: PLACE PATCH, ADHESIVE SIDE DOWN, IN DESIRED POSITION ON TOP OF THE PROJECT. USE A PRESSING CLOTH ON TOP OF THE PATCH TO PREVENT SCOLDING EMBROIDERY STITCHES AND PROJECT. PRESS AND HOLD IRON FOR 15-20 SECONDS ON EACH SECTION UNTIL ENTIRE PIECE IS BONDED. LET PATCH COOL COMPLETELY. FLIP FABRIC INSIDE OUT AND REDO ABOVE INSTRUCTIONS. Embroidered in the USA! If you have any questions about this product by CREANGIETION, contact us by completing and submitting the form below. If you are looking for a specif part number, please include it with your message. Military Police Sew On Embroidered Jumbo American Flag Patch 3" X 5"